Save time. Spring ahead of the big line. Don’t miss the sweetest photo op of the season! Reserve now to skip long lines and last minute pressure. Reservations let you hop along the bunny trail faster, so book your session now. Reserve Now Already have a reservation? Look it up here. See what your time with the Easter Bunny includes. 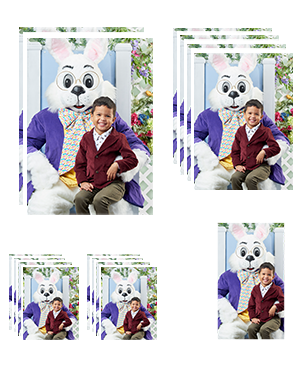 You’ll get photo prints in different sizes, digital downloads and a memorable visit with the Easter Bunny! Check out our special events! 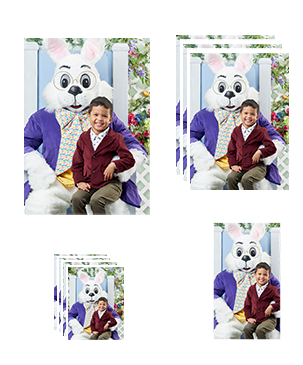 Dress in your best Easter outfit and take your photo with the Easter Bunny for this special event. Capture a one-of-a-kind spring memory with your furry friend. Pet Night times are only available during the above listed hours. In the drop-down, the slot must say “Pet Friendly” to be a designated pet-friendly appointment. *Domestic animals only. Pet owners are responsible for their pet’s safety and the safety of others. All pets must be on a leash or contained in a cage. Please clean up after your pet. PLUS, avoid the big line PRICELESS!